It follows the story of a fairy named Mi who is sent to Planet Pandasia to warn the residents about a great evil that threatens to destroy Pandasia. She chooses a heroic panda named Toby to defeat Gold and Silver, two villains who want to collect the seven Beans of Power and rid Pandasia of its colorful, beautiful environment and replace it with a dark wasteland. First off, I watched the English dubbed version. Last year I got the Funimation channel, and I started watching the anime they aired on it. 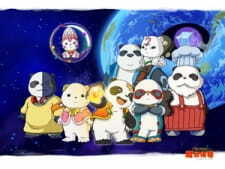 Pandalian was one of the anime aired on that channel. At first I wasn't sure what to think of Pandalian when I started watching it. But, I got hooked on it. I found it really enjoying to watch; the story was interesting, and I really liked the characters. Overall, I think Pandalian was a good watch.